"Winner of Top Award Certificate of 5 Flowers in 2007 National Competition of Beautiful Hotel in a Beautiful Israel". 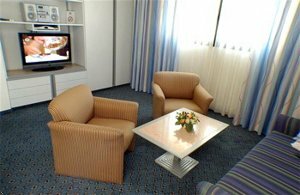 The Best Western Regency Suites is a small and cozy All-Suite Hotel conveniently located on Hayarkon Street (city center), just a few minutes away from the lively Old Jaffa, adjacent to all major international airlines offices, embassies, art galleries, boutiques, department stores, supermarkets and banks. The hotel is surrounded by many restaurants featuring international cuisine and many indoor and outdoor cafes. Ben Yehuda and Dizengoff streets are within a walking distance for shopping. The beach and the promenade are just across the road. The Best Western Regency Suites Hotel is Smoke Free! Smoking is not permitted in the Suites and in the Public areas. Tourists with a foreign passport and that are stamped with Visa class B1, B2 or B3 are exempt from VAT. All other persons entering Israel including those with dual citizenship are subject to 15.5% V.A.T.